Cami and I normally put our children to bed around 7pm. After this they normally play in their room for another two hours and finally go quiet around 9pm. They aren't allowed to leave their bedroom unless they need to go to the bathroom but they can play until they crash. Last night we put them to bed and the noise stopped about 10 minutes later. We listened intently and didn't hear anything so from the hallway I commented "Wow. I can't believe they are all asleep already." Saying this normally gets a strong reaction like "WE AREN'T ASLEEP!" Instead I heard "I'm not sleeping yet Dad." It was our oldest son. "Are your brothers awake?" "I'll check" he responded. The answer came back that they were asleep so I felt prompted to invite him to spend some alone time with mom and dad. One of his favorite things is to watch television shows (we watch them on Netflix) that are educational and entertaining in nature. Dirty Jobs is one of our favorites. So I suggested we watch this new show I found recently called Tanked. 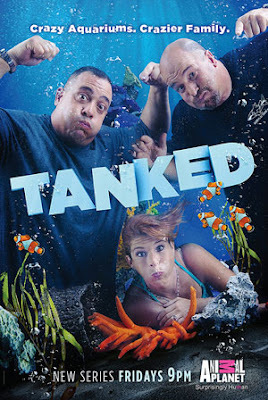 It's about these two guys who own a fish tank company in Las Vegas and the tanks that they build. It's a pretty fun show. Well, our son loved it. At the end he expressed how much fun he had and told us that he loved us then went right to bed without a problem. The reason I share this story is two fold. First, to express how grateful I am that I had that prompting to invite him to hang out with us. And, second, to remind us all that whether it is with our spouse, children, friends, parents, siblings, whomever, spending time with them is critical. Spending time shows you care, that you value someone. Spending time allows you to create tiny threads that solidify and strengthen your relationship. Spending time together is a small and simple thing that will help great things come to pass in your relationships with others.